Managing not to touch anything, I passed from one moreish piece to the next, approaching the bigger, more recent pieces, composed of details equally complex to the foeti, but carved from a single piece of wood. Once restrained the wonder of the sculpting technique, I started “reading” the stories allegorically told by oil barrels and blown airplanes’ fumes finely grinded and poured onto a polluted earth, where animals suffer, whilst still caringly trying to warn humans of their impending self-destruction. Others stacked beautifully “scripted” stories of extinct turtles crushed by political and environmental disasters; elephants carrying the earth, amongst terrorist attacks and oil spillages. “His ideas are expressed with elevated abstraction, but with concrete, precise forms which do not leave room for doubt”; moreover, “this young artist focuses his work on emphasising vital themes such as environmental care and existential social issues”, reported Gilberto González y Lien Martí in Radio Coco last year1. Each detail was a synaesthesia of choky smoke, viscid oil, feather flutter, skin rub that you can almost smell, taste, hear and touch. A labour of love; love for art, for life – animal and human alike. Love for his country, and love for his planet. Love for his medium – warm, incandescent, sharp and smooth at once. “I had a nightmare like this, where humans were the logarithm of mincemeat” said I, stumbling into a conversation that almost defied his silent gaze; and that is when Galindo and I became friends. Galindo talked me through his self-taught sculpting career. He was born in August 1976, in Palma Soriano, a province of Santiago de Cuba, and currently resides in the village of Casablanca, in La Habana. His talent and ability to sculpt wood saw him decorated in six national wood sculpting events, amongst which two first places in the Biennales of this speciality, promoted by the Asociación Cubana de Artesanos Artistas (ACAA). He also won the first price at Heber Biotec S.A. in the Biennial Domingo Ravenet, and the Best Work at the Salón Mensaje y Calidad ARTEX S.A. He is also a painter, and like Michelangelo – his idol – he is master of both crafts, as testified by the two allegoric paintings on his atelier’s wall. He has participated to 23 exhibitions from 1996 to date. One of his works is exposed at the “Centro de Biotecnología del Polo Científico de La Habana”, and various others are found in private collections around the world. One of them features in my university dorm – the five months’ foetus – as I was unable to persuade him that he would have regretted his generosity. 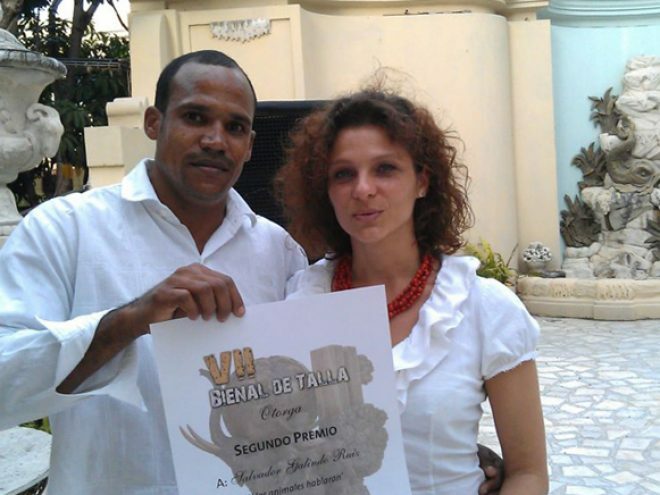 One week later than our encounter, I had the pleasure to be invited to the VII Biennial of Wood Sculpture Awards, at the beautiful and bucolic Museo Nacional de Artes Decorativas, La Habana, Cuba, on the 14th December, where I saw him win the Second Price. His work will be exhibited there until the end of January 2013. Amongst my peals of joy and pride, he calmly said he needed to improve. I sobered up accordingly, and listened to him telling me that he could do better, whilst nonetheless staring in disbelief at the first price, which seemed almost amateurish by comparison. Lili and Cervelio looked at me implying I had to listen and consent. They are two renowned and published scientists in Cancer research, who love Galindo like a son. They participate to Galindo’s monthly “peñas”, workshops where various artists and members of the community gather to share their love for the arts and their community spirit. Galindo teaches children drawing and sculpting skills free of charge; other artists teach singing and dancing. It is a highly elevating, colloquial, informal and extremely informing event. It is Cuban culture in a nutshell – unassuming professionalism, genuine friendliness and exquisite talent; it is easy-going zero tolerance for quality compromise pushing you to give your one hundred per cent very best in total relaxation and peace with yourself. On your next trip to Cuba, I strongly advise you to stroll past Calle San Lazaro, número 1218 entre M y N, in the Vedado district, where Galindo’s works are exposed with the collaboration of the Zonal de los Comités de Defensa de la Revolución (CDR).